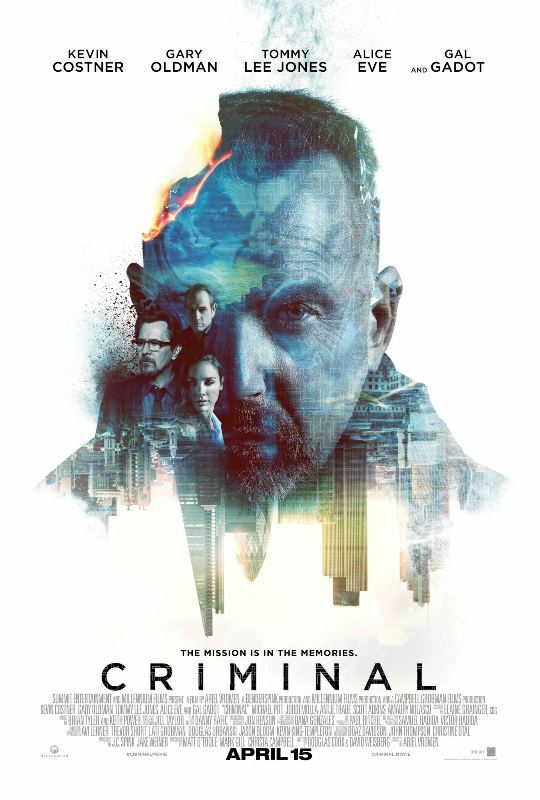 The Fanboy SEO reviews the film Criminal starring Kevin Costner, Gal Gadot, Ryan Reynolds and more. Distributed by Octoarts International. Synopsis: In a last-ditch effort to stop a diabolical plot, a dead CIA operative’s memories, secrets, and skills are implanted into a death-row inmate in hopes the he will complete the operative’s mission. Like I stated last night when I came out of the theater, Criminal is interesting enough but kinda lacking for a real high octane action movie. Still, Gal Gadot is worth the ticket price. The movie aint bad. It’s actually nice. Well if you get past about how contrived the science is in this flick. I mean I read comicbooks so I can get behind the brain/ memory swapping bit, but they didn’t set it up nicely. Like, halfway thru they decide that “oh wait, lets suddenly give Jericho (Costner) a time limit for his usage of Pope’s (Reynolds) memories”. That and the fact that they sold the film like it was Reynolds was the real “lead”; even the poster kinda suggested that they were encapsulated in Kevin Costner’s mind. The movie isn’t so bad at all. I actually found myself munching more popcorn to see what happens next to this colorful yet violent character. Costner was as interesting as can be. I was expecting more action scenes here but maybe because of the supposed “complexity” of the plot, it paves way for gunfights and a few car chases. Really, I expected more from a Kevin Costner action movie. Stereotypes are also abound in this movie like Gary Oldman’s character, who pretty much is a mix-up of past Oldman police roles or Tommy Lee Jones as a doctor who feels and looks sarcastic as hell. I’ll tell you something the scenes with Gal Gadot are just “hnnnnng”. She’s really pretty and while she doesn’t seem like a doctor, she’s actually one. Just not the one we were all expecting. Still I can see the vast amounts of gifs this movie will generate featuring Wonder Woman. “Criminal” is now showing in your favorite theaters nationwide.